Do I need to use the United MileagePlus Explorer card to buy the ticket to get benefits? 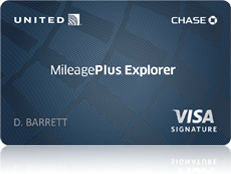 Since I’ve gotten the Chase MileagePlus Explorer Credit Card, my friends and colleagues have been asking me questions about the MileagePlus Explorer cards benefits. Do you have to use your MileagePlus credit card when buying United tickets to obtain the benefits? I routinely purchase my United flights with my business credit card via the United/Continental Website. I have my MileagePlus Explorer card stored into my profile, but I change my personal card to my business card upon clicking on “Purchase.” Since the MileagePlus Explorer card is in my profile, I still get the United MileagePlus Explorer benefits of free baggage and earlier boarding. Unfortunately I do not get the extra points as that would be a great loophole!